I hope this position will appeal to you. Please read through it as it describes exactly what we're looking for and what we are NOT looking for! 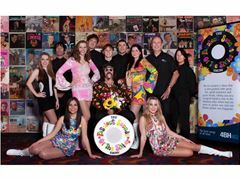 We do three different shows - the most popular one is 4BH's "The Fabulous Sounds Of The Sixties Show". It's an 12 person show plus production. We play venues like Twin Towns Services Club & Kedron-Wavell Services Club (biggest clubs in this part of the world). It is doing well, having picked up the award for Best Production Show for the last three years at the Entertainer Of The Year Awards for clubs. The show is sponsored by 4BH and is compered by 4BH’s Greg Newman. The same group do an alternate show comprising of '50s, '60s, '70s material plus originals, called "Darren J Ray & The Love Bugs". We are also bringing in some contemporary material. Some of the material is the same as the Fab Sixties Show. The nucleus of this act is my own four-piece band which performs independently of the show as well. Again, much of the material is the same as the shows. The drummer is an integral member of all acts. We are looking for an excellent timekeeper who can play like the original records when required to and who can sing. We want someone who will play for the song and not be a rock god! Image is also a crucial part of the Sixties Show. A well-presented guy (or girl) under 30 is preferred. We would prefer someone with a full head of hair! We all look like we just stepped out of 1965 so the balding, shaven head, earrings, piercings and tattooed brigade would not be suitable. But this show will not suit someone who is too involved with a day job or family commitments. We treat it as a business. Hence we have an alcohol-free, drug-free policy in the show. We are a happy group of mainly young performers. Egos are left at the door upon arriving. Attitudes don't make it to the door! Long-term, we are looking at recording more of our originals, getting TV exposure and taking this as far as it can go. We recently featured on the TV show, 'The X Factor'! We currently perform about twice a week; our drummer for much of the past 23 years is a lady in her early fifties who has left Brisbane and has young teenage boys to look after on weekends. She’s an excellent player and is proving hard to replace. Money averages $200 for most shows. Some acts may say they offer more than that. That's fine but we are a TWELVE-PIECE act and work regularly. Money is paid promptly into respective bank accounts usually the week following the weekend's performances. The show has been going since 2002. I do it full-time. An audition would involve learning six audition songs. I can send you them as MP3s if requested. Let me know if the position interests you and, if so, please forward me a recent photo of yourself and any demos. Experience is not necessary but a good attitude, talent, love for this style of music and the desire to be part of a successful team is. - suitable for someone who is ambitious and wants to progress with us. - must be an excellent player who can replicate the sounds and styles on the original records and who can definitely sing. - well-presented, educated guy under 30 is preferred. - you must have hair! - position will not suit someone with earrings, piercings, shaved head or tattoos! - show will not suit someone who is too involved with a day job or family commitments.